Awareness is growing about trauma and its impact on individuals and communities. While most approaches that address trauma focus on treating the individual, this UNITY webinar will explore community-oriented approaches. UNITY will introduce the concept of trauma, describe how it can spread to others, and share approaches to preventing violence that are rooted in an understanding of the impact of trauma on individuals, families and communities. Join Rachel Davis and Howard Pinderhughes in a conversation on the implications of community trauma for efforts to prevent violence. Register now. Stay current on news, research and innovations with Reports from the Field, a new UNITY web page dedicated to cutting-edge stories and reports about preventing violence in U.S. cities. This running catalog of recommended reading is designed to spark new ideas, prompt discussion and strengthen cities’ efforts to create peaceful streets. Explore the nine elements of the UNITY RoadMap with this online module. 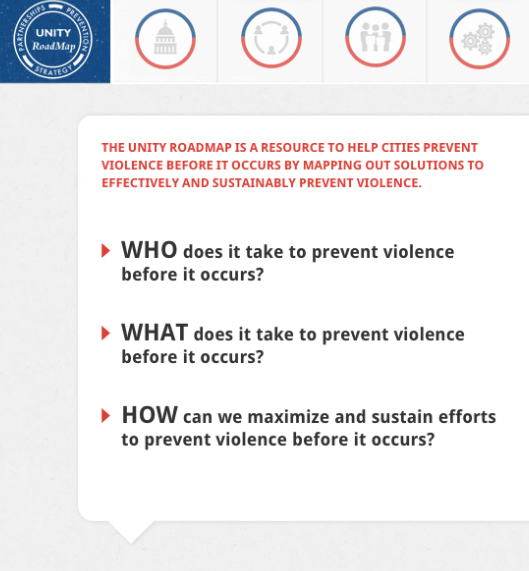 This new interactive format makes it easy to learn about the who, the what and the how of preventing violence, in whatever order you choose. Refine your city’s efforts with a quick read-through of all the elements, or dive deep into a particular element where you’d like additional guidance. Get started, and use the UNITY RoadMap Gauge in the lower right corner, to identify gaps and measure progress. Connect with @UNITYinitiative and our 350 followers! Join the conversation on hot topics in the field of preventing violence, share great quotes, and more.